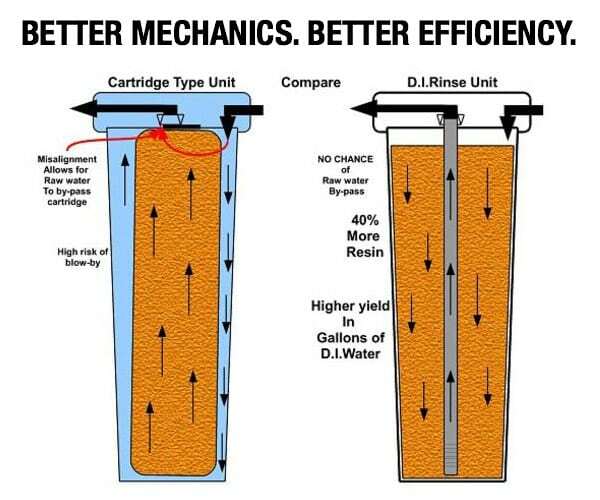 Convert your present cartridge system to a down tube system and increase your output of DI water production by 40%. When you use a cartridge you run the chance of getting blow by when the seal at the top starts to leak internally, this gives you a false reading and causes you to change resin way too soon. It is simple to do and requires no tools. If you are interested in converting your System to a DOWN-TUBE System, all you need is our Conversion Kit . Easy conversion to get 40% more spot free water out of your big blue type water system. If you are using a cartridge type of DI system you are wasting resin and money.